indianaquariumhobbyist.com » Forums » Fishkeeping and Aquaristics » Stingray !!!!! http://indianaquariumhobbyist.com/community/ :: View topic - Stingray !!!!! Posted: Tue Apr 03, 2012 1:10 pm Post subject: Stingray !!!!! 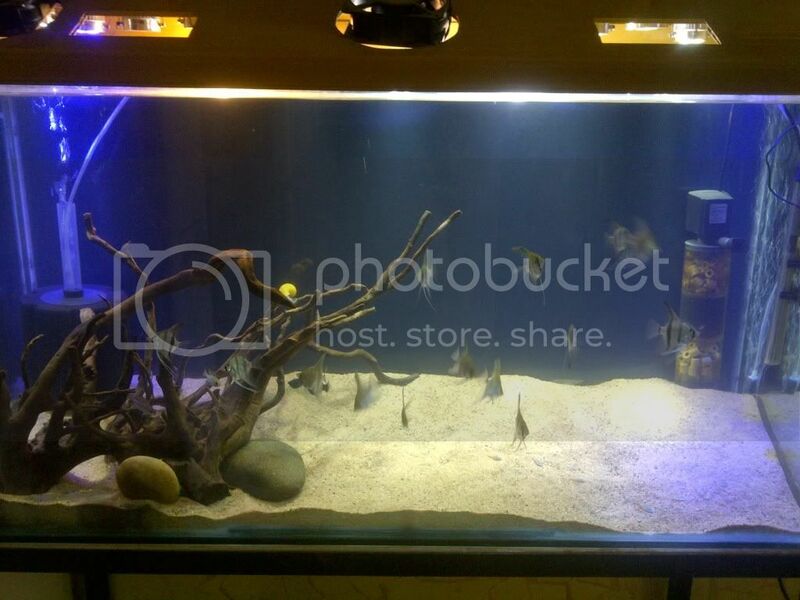 was surfing some sites and videos for new ideas and happen to see a tank with angles, driftwood and stingrays. soo that really interested me and gave me a thought to introduce a stingray in my aquarium. so started surfing but getting a mix reviews. LFS here has it from where i get everything regularly. he said you might take a chance he has total 4 rays 1 of them is confirm pair in breeding condition. it has been with him since a year and half and the other 2 guys are with him since 4-5 months. they are pretty small. 1) is that a good call to keep stingray ? 2) how much can be paid for a stingray ? 3) has anyone here ever kept rays ? 4) any special care or requirement for ray ? 5) the LFS feeds them carnivorous hikari sticks... is it good enough ? thanks for the help in advance... any comments or your inputs/experience is much appreciated. Posted: Tue Apr 03, 2012 1:30 pm Post subject: Re: Stingray !!!!! 3) There are quiet a lot of people who keep stingrays. 5) Stingrays are predators, so feeding them frozen food is what i would personally recommend. Feeders are a big no no, so dont even think about them. Posted: Tue Apr 03, 2012 1:39 pm Post subject: Re: Stingray !!!!! Posted: Tue Apr 03, 2012 1:53 pm Post subject: Re: Stingray !!!!! years back even i wanted to keep them but then dint because they need huge tanks. Never ever take advice from LFS because they are intrested in bucks and not the life of fishes. it will be happy in a 125 - 250 gallong tank. the width of the tnak should be good enough too. i know this because i had seen a FW stingray tank in hongkong, went there three times and still all were alive and growing. i asked the owner everything about it and he told me everything as he was a hobbyist too. he had kept rays with arrowanas in a 350 gallon tank. he use to feed home cultured worms, fish, some pellets, etc. he said live food is a must. that time i descided that ill keep rays when i can keep a 200 gallon tank. Posted: Wed Apr 04, 2012 11:04 am Post subject: Re: Stingray !!!!! i m not sure about bare bottom tanks, there are mix reviews on the substrate to use in rays tank. have seem many rays with sand, and rocks and some wood to decor. Posted: Wed Apr 04, 2012 11:07 am Post subject: Re: Stingray !!!!! thanks bro, i am planning ray and am also planning out a big tank... if i house this ray in my 4X2X2 tank then this tank will be grow out tank and then the ray will be transferred to a bigger tank... i might plan a 6X2X2 tank if the ray gets big enough. Posted: Wed Apr 04, 2012 11:09 am Post subject: Re: Stingray !!!!! this is the tank in which i am planning to house the rays. Posted: Wed Apr 04, 2012 12:05 pm Post subject: Re: Stingray !!!!! Wow, Sting ray! great idea! I have never seen one! Posted: Wed Apr 04, 2012 1:01 pm Post subject: Re: Stingray !!!!! I would suggest a more broad tank for them to move freely. My personal opinion would be invest in a stingray only if you can give them big tank interms of breadth..
Posted: Thu Apr 05, 2012 12:13 am Post subject: Re: Stingray !!!!! Get a large tank, then buy the fish...These fish will need wide tanks. Posted: Thu Apr 05, 2012 12:48 am Post subject: Re: Stingray !!!!! You need a 2-3ft wide tank for the rays. RESEARCH BEFORE YOU BUY ANYTHING !!! Posted: Thu Apr 05, 2012 12:57 am Post subject: Re: Stingray !!!!! i might plan a 6X2X2 tank if the ray gets big enough. Rays do get big enough for that size tank width. Get 3' wide tank if not 2.5'. Permanent 2' wide tank is not advisable for long-tailed ray like Potamotrygon motoro. Also I wouldn't buy a pair of male beating up female persistently. That's certainly not a 'True Pair'. Many people attempt to keep Stingrays but unfortunately only handful of them know how to keep them well enough. They do not necessarily need barebottom tanks. A thin layer of fine sand is enough to keep them happy. Posted: Thu Apr 05, 2012 10:30 am Post subject: Re: Stingray !!!!! Posted: Thu Apr 05, 2012 11:39 am Post subject: Re: Stingray !!!!! Posted: Thu Apr 05, 2012 11:52 am Post subject: Re: Stingray !!!!! People just don't listen or understand.....!